If you’re looking for an introduction to the R computing language and statistical platform, R in a Nutshell, by Joseph Adler, may be worth a look. This book is a member of O’Reilly Media’s “In a Nutshell” series that may be familiar to you if you dabble in programming. 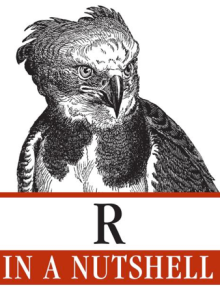 The goal of the book is to introduce the reader to many aspects of the R language, from the basic architecture and syntax of R to some of the many available statistical and graphical facilities of the language. R in a Nutshell begins with a section on downloading and installing R for complete neophytes. The instructions cover Mac, Linux, and Windows installations, as well as some of the differences between the systems. The subsequent introduction of the R language in Part II will probably be most digestible for users who already have some experience with another language such as Java or Matlab or whatever. Adler covers the basic commands and control structures (for loops, if statements etc) that a programmer will be looking for, so that your transition to the R language can go as smoothly as possible. Though it is detailed, the explanation of the language may be overwhelming for readers that have little or no experience with computer languages. Part III covers the standard issues of getting data into R from other programs, interfacing with websites and databases, formatting data for eventual analysis, and making graphics. My personal copy contains a forest of little post-it tags in Part III because I constantly return to this section as a quick reference for commands (particularly graphics options) day in and day out. R in a Nutshell also tries to cover some of the basic and some of the not-so-basic statistical tests available in R. It is assumed that you have some concept of what tests you want to run and why you would be running them, so that R in a Nutshell can primarily provide you with an introduction to the syntax of your favorite statistical test. Of course R in a Nutshell can’t hope to be an exhaustive accounting of the capabilities of the R language, but many of the common statistical tests are explained. The book finishes with a section on the Bioconductor package for R, which may be of interest to some gene-jocks looking to migrate away from some of the ludicrously priced commercial software that permeates that community. On the whole, R in a Nutshell excels at providing a first-pass introduction to R and then making itself useful as a quick reference to leave sitting on the desk next to your computer (once you have tagged it up appropriately for quick searching). This is particularly true for users migrating from another programming language. However, if you’ve never done any programming on a computer, and if Excel pivot tables still seem like dark magic to you, R in a Nutshell might not be the ideal introduction to R for you. If you feel it’s likely that you’ll be overwhelmed by too much programming info all at once, I’d instead recommend a book like Zuur et al.’s “A Beginner’s Guide to R” or Dalgaard’s “Introductory Statistics with R”.